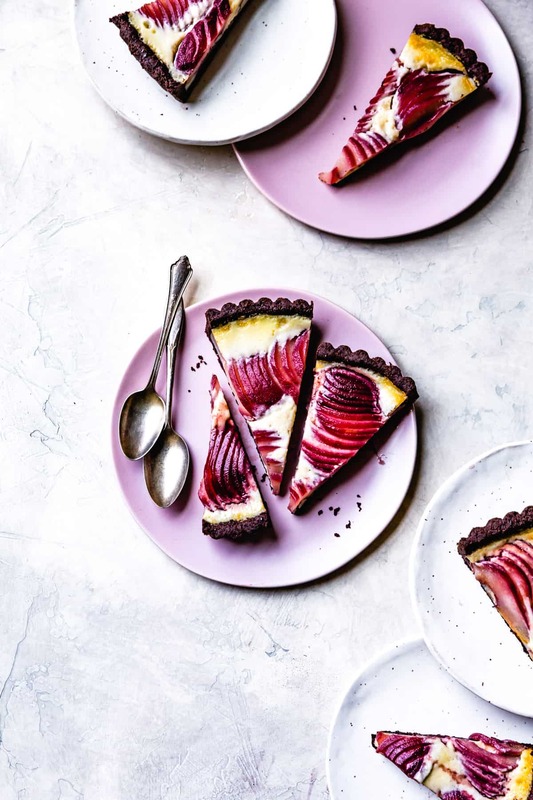 With a cocoa almond crust, vanilla crème fraîche custard, and mulled wine poached pears, this gluten-free pear custard tart makes a showstopping holiday dessert. Thanks to Bi-Rite Market for sponsoring this post! I’m a total sucker for specialty grocery stores, and I’ve been a fan of San Francisco’s legendary Bi-Rite market since I moved here in 2004. 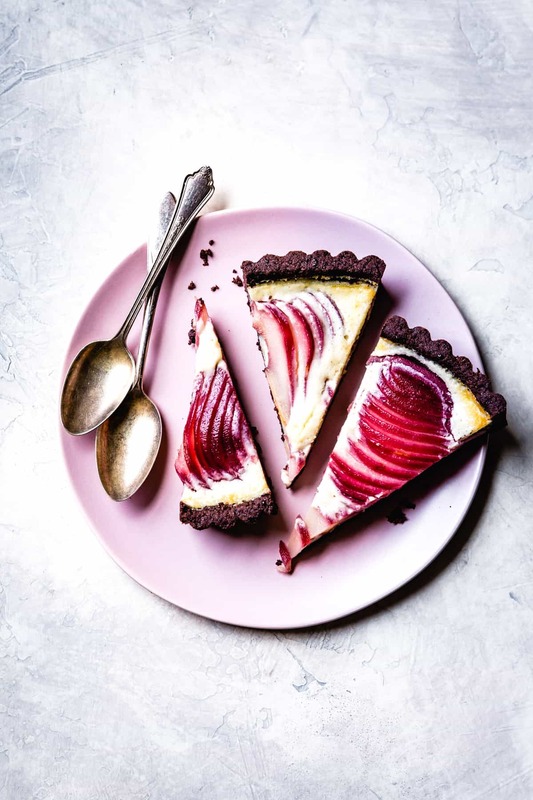 At the original location on 18th street, Bi-Rite packs an enormous selection of goodies into their tiny 2,000-square-foot space: uncommon seasonal produce, local cheeses, exquisite chocolates, and sweet treats from their creamery across the street. I always find new-to-me local, artisanal, organic treats to try, making it well worth the effort of navigating narrow aisles and joining my fellow SF foodies in line. While Bi-Rite is a destination spot, it’s also a true neighborhood establishment where you can pick up essentials for a dinner party or your next baking project. 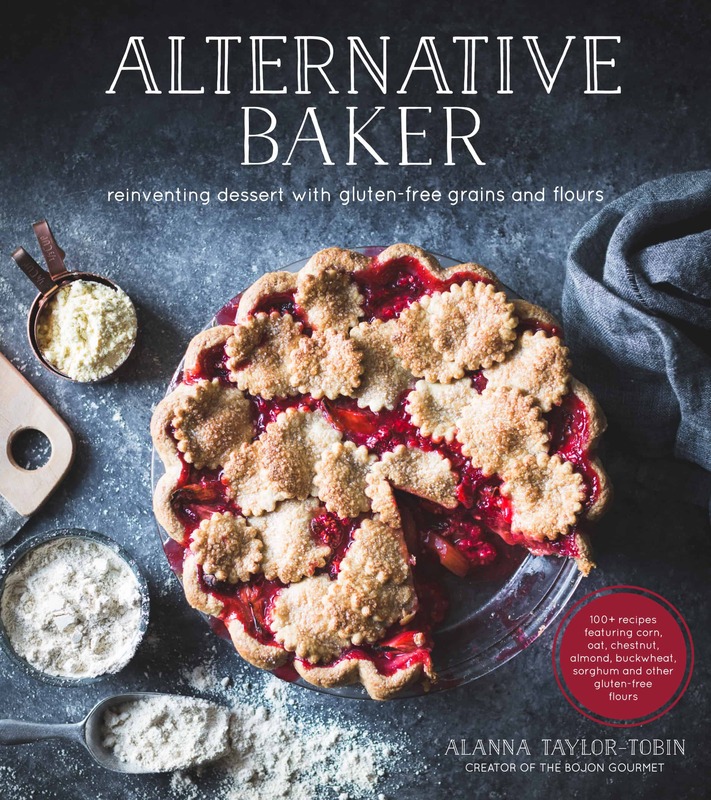 In fact, much of the obscure produce featured in Alternative Baker came from Bi-Rite – quince, bergamots, rhubarb, figs, heirloom apples, tiny ripe strawberries, and the sweetest pomegranates. There you get the variety and quality of a farmer’s market and the convenience of an old-school grocer. 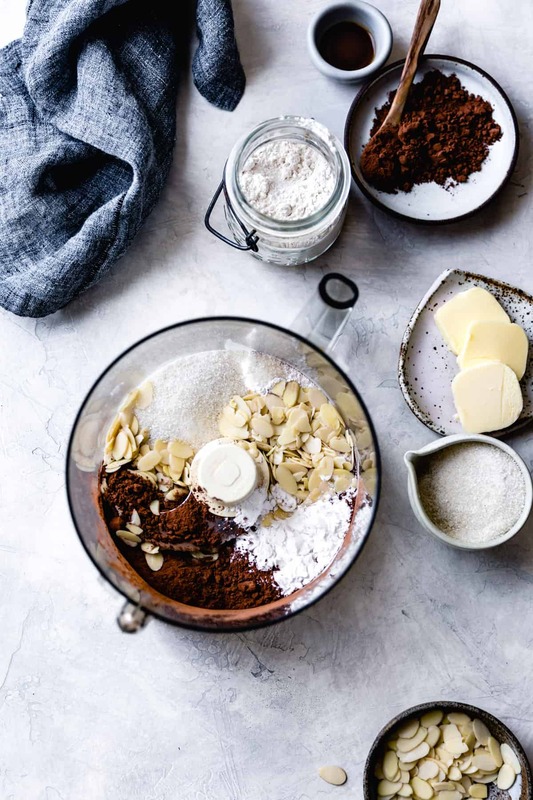 There’s an excellent selection of flours, sweeteners, spices, dairy, as well as fun products like chestnut puree for making this cake or the addictive chocolate bark that inspired this recipe. 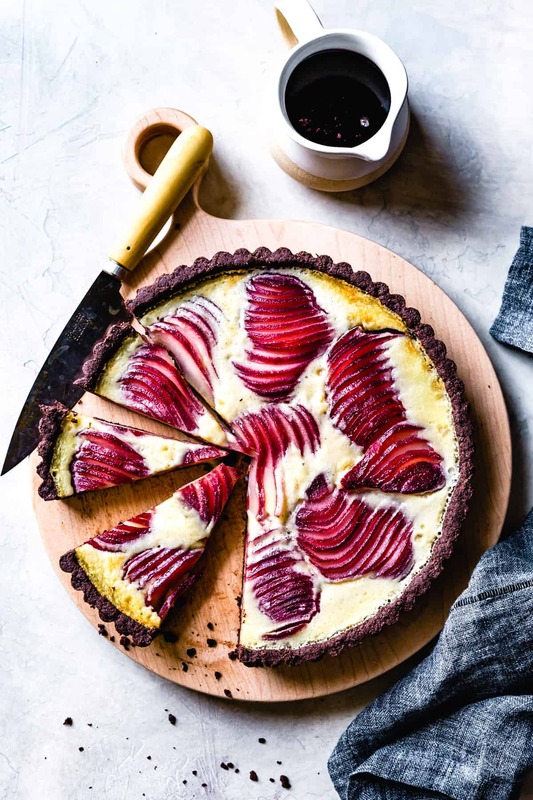 This gluten free pear custard tart starts with Bi-Rite almonds ground powder-fine and mixed with gluten free flour, cocoa powder, butter, and sugar to form a press-in crust that tastes like your favorite childhood sandwich cookies. A food processor makes quick work of grinding the almonds, then incorporating the butter until the dough clumps together like damp soil. Just press the crumbs into a lightly oiled pan, freeze, then bake – no rolling or pie weights needed. The base recipe for this almond cocoa crust comes from my book Alternative Baker. 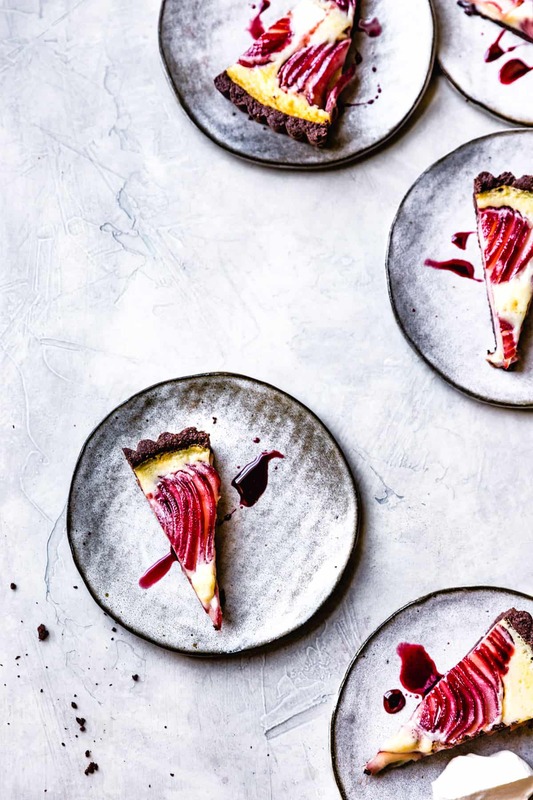 It’s a versatile recipe that I’ve used for cheesecakes and pudding pies as well as the chocolate pecan cranberry tart from Alternative Baker – a reader favorite around the holidays! Here I trade blanched almonds for the almond flour I usually use and subbed in Bob’s Red Mill 1 to 1 gluten free AP flour in place of sweet rice flour. You can of course grab all of these ingredients at Bi-Rite! The par-baked cocoa almond crust gets filled with a simple custard flavored with crème fraîche and vanilla. 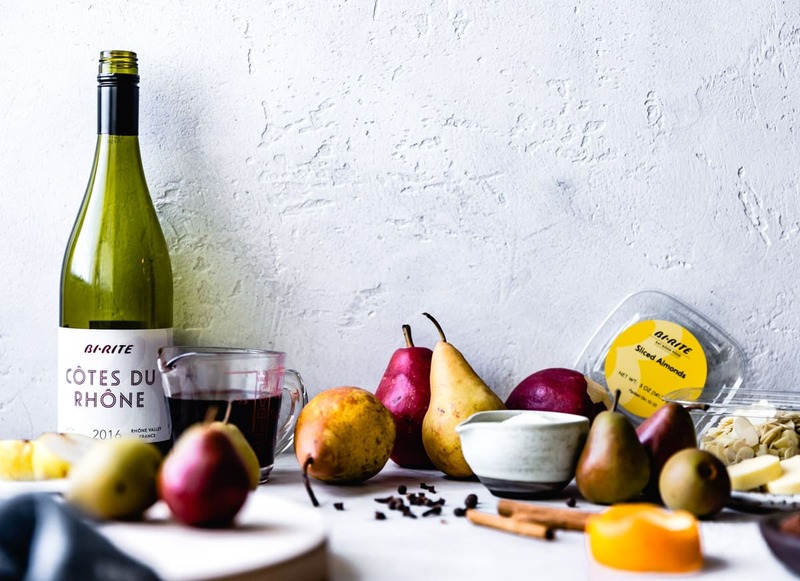 Into the crust go pears poached in Bi-Rite’s Côtes du Rhône flavored with mulling spices and orange peel. I had my pick of 6 (!) different pear varieties including Bosc, Bartlett, Seckle, and some beautiful red pears, all from local farms. 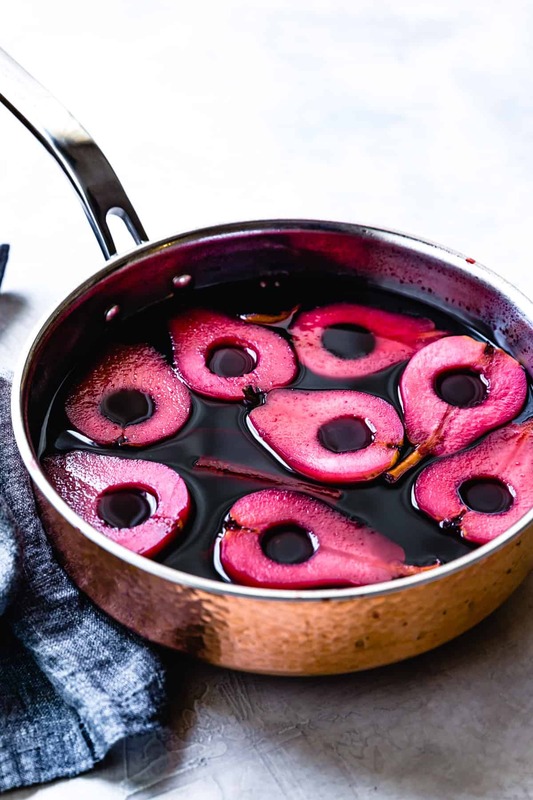 Poaching the pears in red wine turns them a brilliant burgundy and infuses them with holiday cheer. 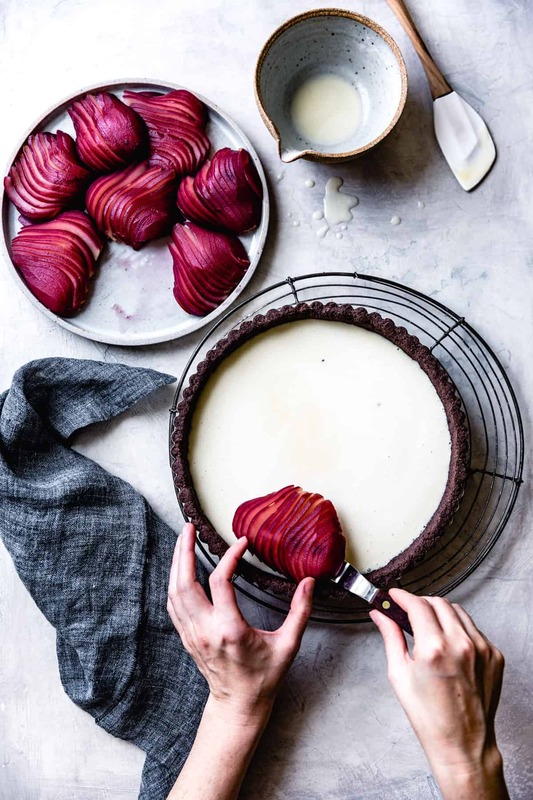 Thinly sliced and nestled in creme fraiche custard and a cocoa almond crust, they bake into succulent slivers of spiced pear love. 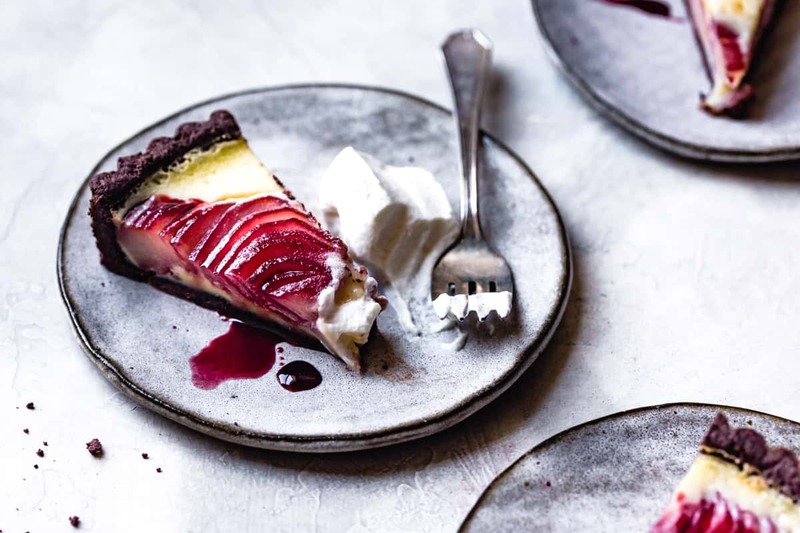 A bite of crumbly, deeply chocolate crust gives way to cool custard and warmly spiced fruit. Sweetness is offset by bitter cocoa, earthy wine, and bright spices. 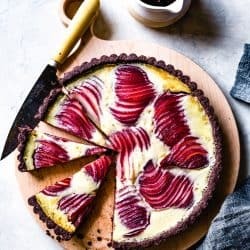 This tart is a boon for dinner parties and potlucks since it can be made earlier in the day, and each component can be made a day or two in advance to ease day-of prep. If you’re in SF, I highly recommend heading to Bi-Rite for all your holiday baking needs. From exceptional farm-direct produce to locally produced chocolate, the best ingredients make the most delicious baked goods. 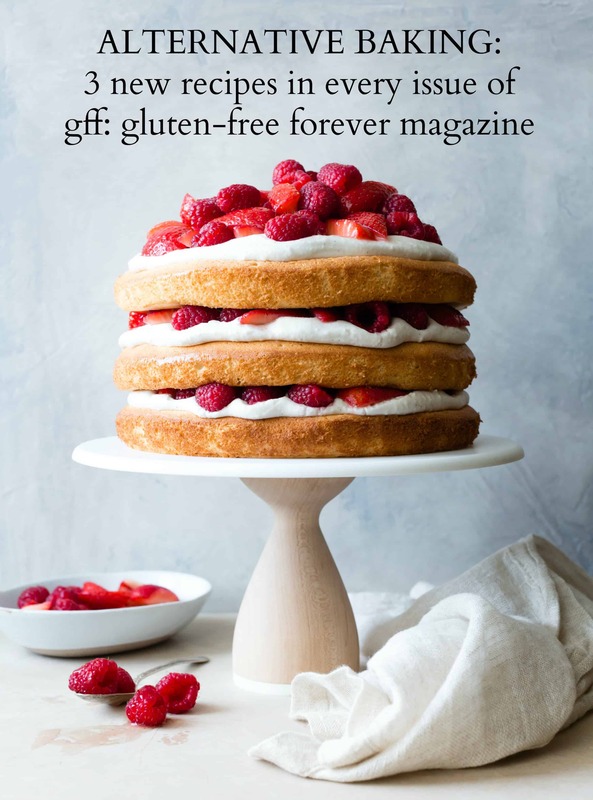 Looking for more gluten free tarts? 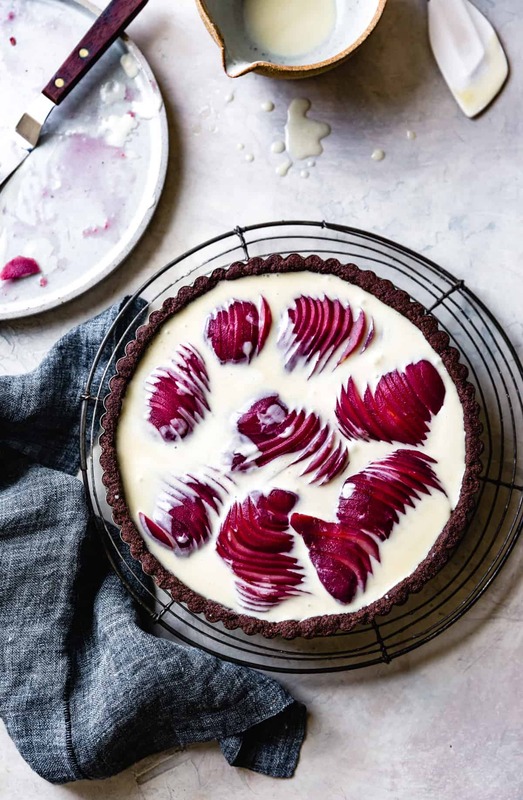 Check out this round up of 16 holiday-ready gluten free pies, tarts and galettes! 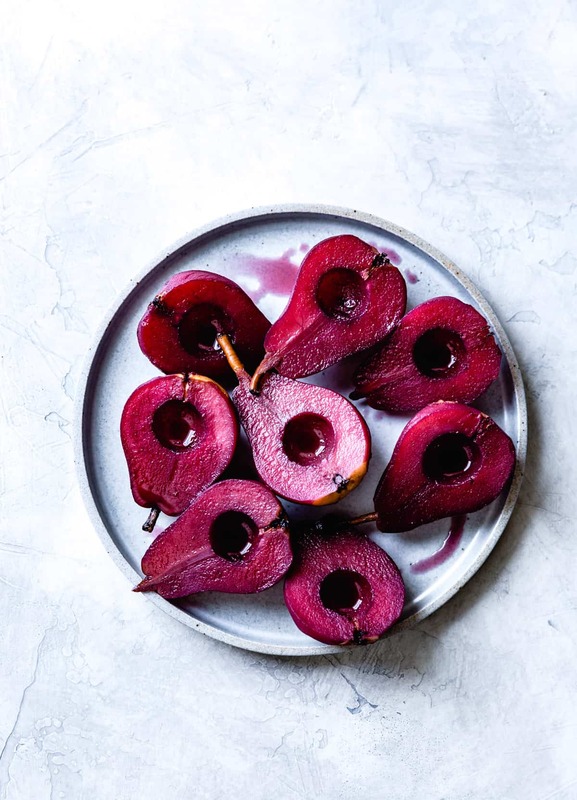 Infused with the flavors of mulling spices, red wine, and citrus, these poached pears are divine eaten on their own, warm, with ice cream and their reduced poaching liquid. But they really shine when baked into a cocoa crusted tart filled with luscious crème fraîche custard. Make these up to 1 week in advance and chill in their liquid until needed; they will absorb more and more flavor as they sit. Put the wine, water, sugar, vanilla, orange zest, cinnamon, cloves, and allspice in a dutch oven or saute pan with high sides. Bring to a boil. Add the pears and simmer until just tender but still holding a shape, 10-20 minutes (longer if pairs are not very ripe), turning the pears over halfway through. Remove from the heat and let sit until ready to use, or cover and chill for up to several days. The pears will continue to pick up color and flavor from the wine. Remove the pears to a plate and strain the poaching liquid to remove and discard the spices. Simmer the poaching liquid until thick and syrupy, 15-25 minutes. You should have about 1 cup of liquid. 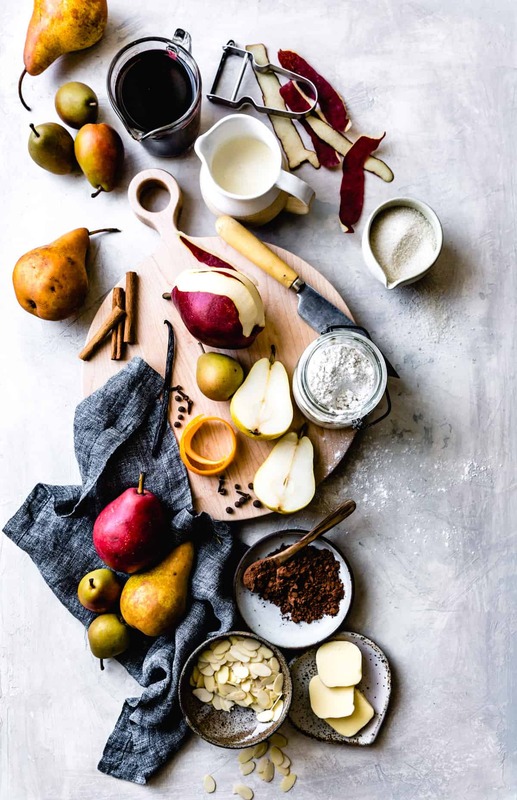 When ready to bake, remove the stems and blossoms from the pears and slice lengthwise ¼ - 1/8 – inch thick, keeping the slices together. 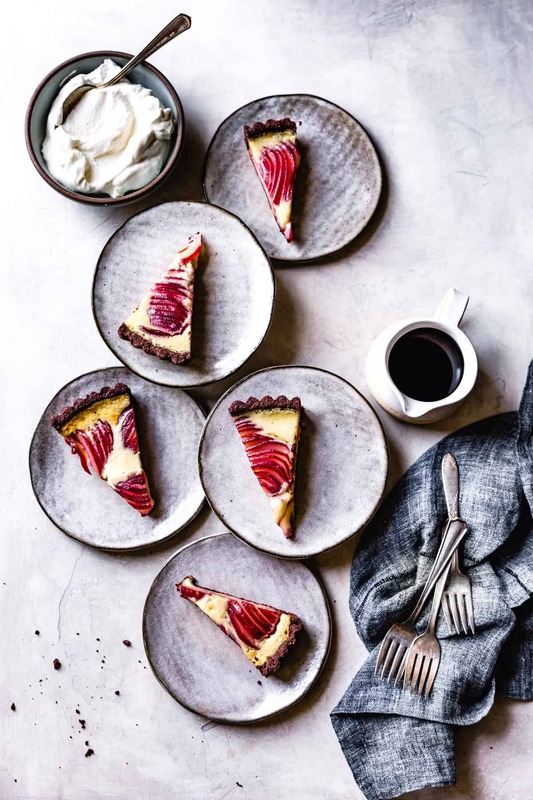 With a chocolate almond crust, vanilla creme fraiche custard, and mulled wine poached pears, this gluten-free pear custard tart makes a showstopping holiday dessert. 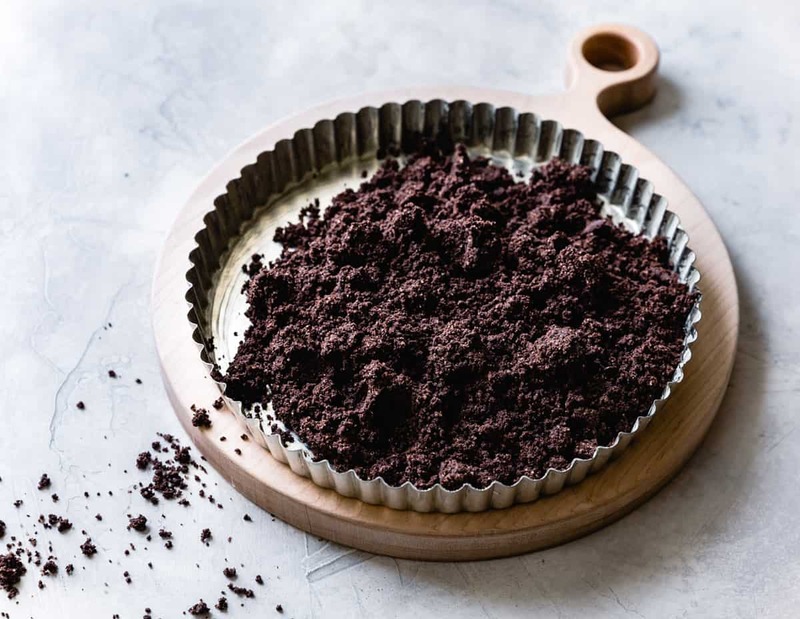 In the bowl of a food processor, combine the almonds, GF all-purpose flour or sweet rice flour, and cocoa powder with the tapioca starch, sugar and salt. Process until the almonds are finely ground. Scatter the butter pieces over the top and drizzle with the vanilla extract. Process until the dough starts to clump together. 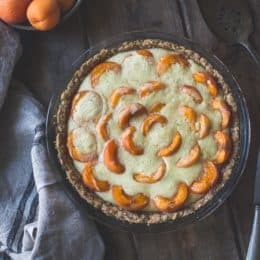 Dump about half of the crumbs into a lightly sprayed or buttered 9-inch loose-bottom tart pan and press the dough evenly into the sides of the pan. Add the remaining crumbs and press them into the bottom, keeping the edges square. (It usually takes me about 10 minutes to make it look pretty.) Freeze until firm, 15–30 minutes, or wrap and freeze for up to 1 month. Place the tart pan on a rimmed baking sheet and bake until slightly puffed and firm to the touch, 20-25 minutes. Remove the crust from the oven and, while it’s still hot, press the sides and bottom firmly with the back of a spoon; this will help it hold together when cool. Keep warm. In a small bowl, whisk together the sugar, flour, and salt. Whisk in the egg, then the cream and crème fraiche until smooth. Pour the custard into the bottom of the baked tart shell. Gently fan the sliced pears out over the top of the custard. Sprinkle the 1 tablespoon sugar over the pears. Bake the tart until the custard is puffed and set, 30-40 minutes. Remove from the oven and let cool until warm. Release the sides of the pan and let the tart cool completely. 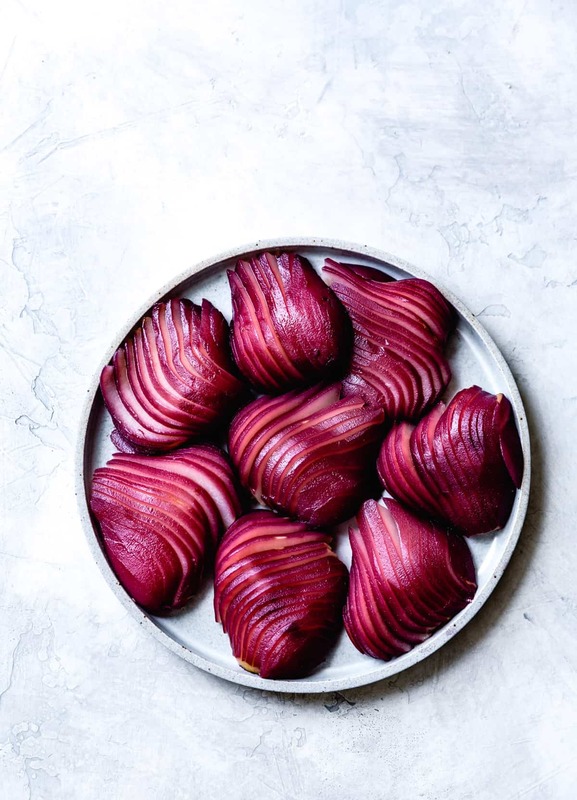 Cut into wedges and serve at room temperature, or chill. 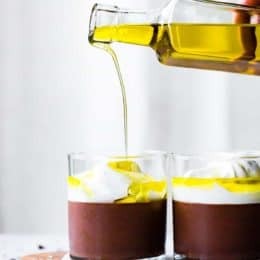 Serve the tart drizzled with the reduced poaching liquid. Here's a deliciously tipsy use for leftover poaching liquid. 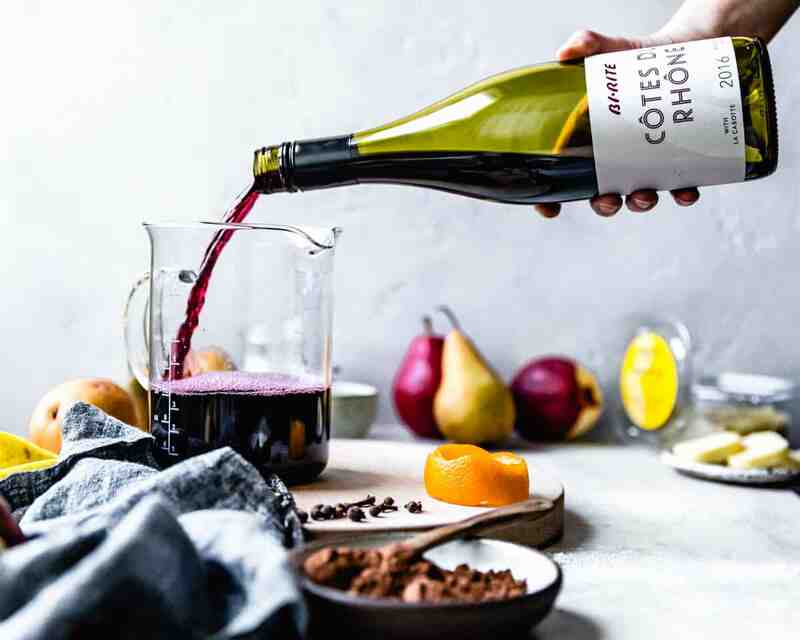 A twist on the New York cocktail, this festive sip gets big flavor from pear-infused mulled wine syrup. Make a big batch and serve them up at your next holiday shindig! Combine all in cocktail shaker and shake or stir for 20 seconds. Strain into a rocks glass filled with ice. Top with fizzy water if desired. I am just curious about the texture of the crust. Is it more of a crumbly granular texture or does it have a more structured texture? How does it hold together with the very wet filling ingredients? Thank you! It looks absolutely AMAZING! I’m having a hard time choosing between your desserts for a holiday dinner treat! Great question. The texture is like a chocolate shortbread cookie. It holds together well, and stands up to the wet ingredients for a good 2 days, and it has a meltingly tender texture when you bit into it. With the buttery texture, deep chocolate taste, and hit of salt, people go kinda crazy when they taste it for the first time. :) I hope that helps! Please let me know what you end up trying or if you want any advice to help narrow things down! This gave me goosebumps, honestly. I can’t believe how easy it apPEARs to be! *wink* get it? Thank you for sharing. This would be a spectacular holiday treat. Haha, the way to my heart is through silly puns, how did you know?! ;) Thanks so much for the sweet words! Great questions! You can absolutely make this in a 9-inch pie pan. It might be a tad more challenging to remove from the pan but it should work as written, no changes needed. I’ve made this crust in a pie pan for this recipe and it works great! 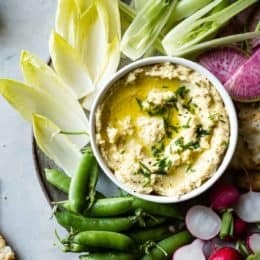 I love the look of this recipe, but I’m a teetotaler and I was wondering if there was a way to make this without using any alcohol. I know that the alcohol content cooks out, but I can’t even stand the taste of wines or beers cooked into food. I’m not a fan of the flavor it gives, so I always try to find alternatives. Any suggestions? Does that work for all recipes that have alcohol? Even ones where you cook with alcohol? Or is that just for baking? Plus, would that also be the alternatives for this recipe only? You have a few other recipes I’d like to try but they also include a type of alcohol in them. Like your pie recipes with walnuts and pecans that use Bourbon or Nocino? Either way, I was wondering what you would replace for something like that. Or if there even is a guide about how to replace alcohol that you would use to help you figure out which liquid works best with specific flavors or different textures, etc. Hm, there are probably guides online (let me know if you find a good one! ), but in general you can just replace the alcoholic liquid with another liquid that you like the taste of, or sometimes you can just leave it out entirely. For those nut pies, you could just omit the booze, or coffee could be a nice flavor to add in there if you like coffee. 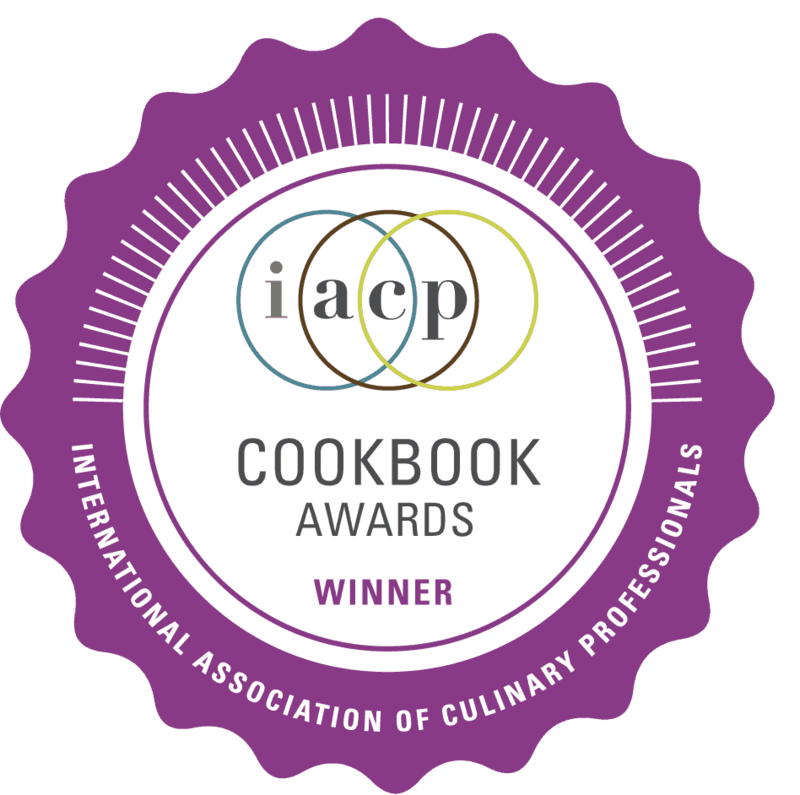 Feel free to experiment, most recipes are pretty forgiving! ¡Que receta tan atractiva! Me ha costado entenderla porque mi ordenador no hace una buena traducción. Pero seguro que la hago en estas fiestas. Me ha gustado mucho las indicaciones que das para poder ir haciendo con días de antelación. Ya te cuento que tal me sale. Un saludo desde las Islas Canarias. Such a great market, you’ll love it! Thanks for reading and for the kind words.